We estimated that trying to correlate the CO2 concentration with global temperature over the whole 130-year period at once when the temperature varies so much gives a too vague estimation. Therefore, we hypothesized that we could find in this graph shorter time periods in which to separately verify the correlation between these two variables, and calculate the overall correlation at the end. We also considered that this approach would correct a possible error made by extending the correlation during the last period in red over the previous 90 years. Indeed, starting from this premise, we could identify three 30-year warming trends (1880-1910, 1910-1940, 1940-1970), and the fourth that lasted longer (1970-2012). However, the IPCC admitted that global warming has paused between 1998 and 2012, but later, some climatologists started to claim that this warming hiatus never happened. To avoid using controversial data, we excluded the temperature statistics above 2000 from this assessment. See these trends in green in Figure 2. Over the whole period covered in the graph, the CO2 concentration is rising, yet with a higher and constant rate since 1970. We started the analysis with Period #4 where there is a perfect positive correlation (the correlation coefficient is 1.0) between the two variables. However, this perfect relationship could have been achieved by the article authors by adjusting the measuring scales of the two variables to give this impression. This is a common mathematical trick, which is perfectly acceptable. Note that the purple horizontal lines in ovals are used to assess the trending angles of the two variables in each period. In Period #1 (1880–1910), the CO2 concentration is rising and the temperature is receding, which means a negative correlation. This is a proof that during this period, the temperature variation was not driven by CO2. Period #2 (1910–1940) has a positive correlation, but the value of its correlation coefficient is less than 0.3, meaning that the relationship between the two variables is weak and likely insignificant. 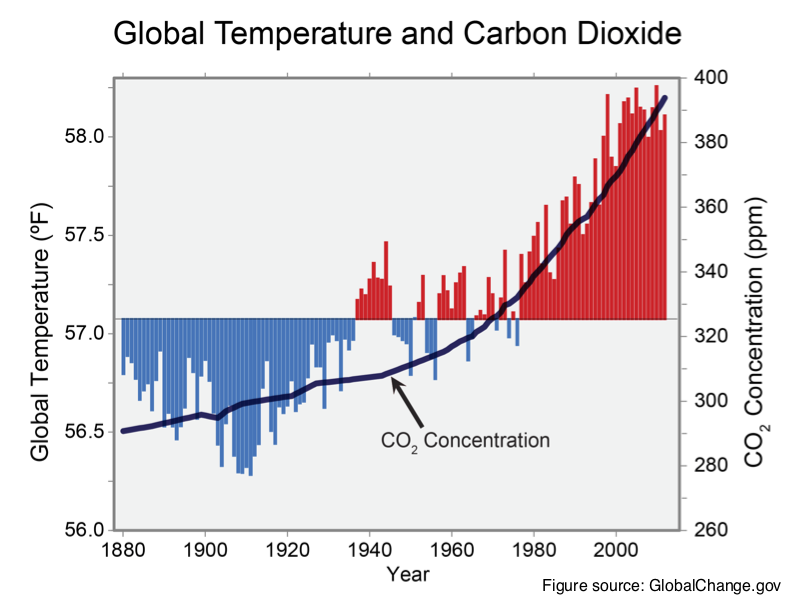 When compared with Period #4, the temperature is rising with a rate several times higher than the CO2. 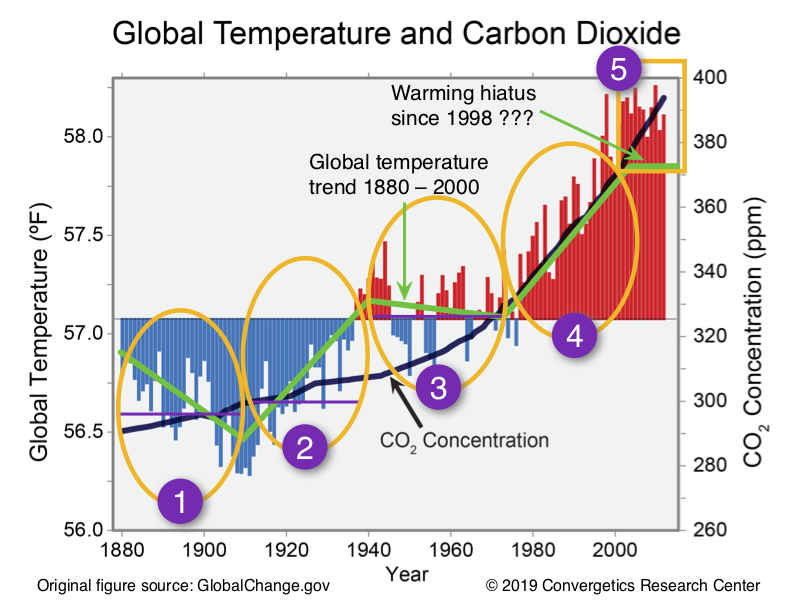 A quick verification of the temperature graph found on the CRU website in January 2019 shows that Period #2 has the same warming rise as Period #4: 0.47ºC. This could not happen if there was a correlation between the two variables. Period #3 (1940-1970) also has a weak and insignificant negative correlation similar to Period #1. While the CO2 concentration rate is higher than during the first two periods, the temperature decrease is smaller than during Period #1. In general, experts consider correlations significant when their value surpasses at least 0.8. With just one period with a perfect CO2 temperature correlation, yet two periods with negative correlation and another one with positive, but weak correlation, the overall correlation is negative or zero. The carbon dioxide concentration IS ABSOLUTELY NOT the climate change driver.